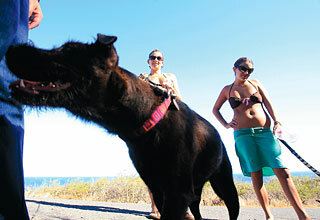 Sara Caires, left, smiled as her puppy Gaia sniffed at a passer-by as friend and fellow dog owner Angeline Grable, right, kept her dog Oliver leashed during a visit yesterday to the Ka Iwi Shoreline Park that leads to Makapuu Point. Until recently, pets were allowed along the trails provided the animals were leashed, but the state Department of Land and Natural Resources has changed that rule and now prohibits pets completely. The Hawaii Kai Neighborhood Board will meet today to discuss the issue. A rival decries using political contributions for an ad "full of lies"